Brunel's Great Western Railway from London to Bristol climbed up the valley of the Thames, passed through Goring Gap in the Chilterns alongside the river, then carried on along the Vale of White Horse to Swindon before crossing the watershed to the valley of the Bristol Avon near Chippenham. Brunel was then faced with a spur of the Cotswolds - a lump of high ground blocking his way - that he chose to overcome by a tunnel quite unlike anything else in its day, from Corsham through to the village of Box, lower down the Avon that made its meandering way on through Melksham and Bradford to get to Bath (see also Bathcentre and Morebath). To this day, Box tunnel remains magnificent in its grandeur - with the Intercity 125 trains looking almost toy-like as they emerge. There are three MORE tunnels between Box and Bath! 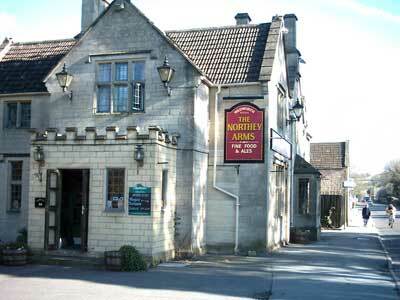 There's a further view of Box from the surrounding hills on our Colerne page. 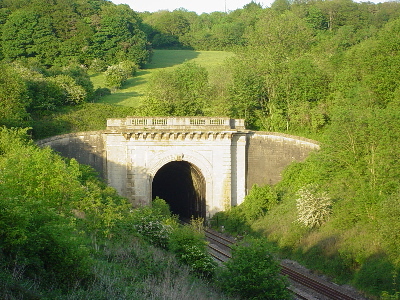 There's pictures taken near the other end of the tunnel at Thingley junction where the Melkshamtrain turns off too. 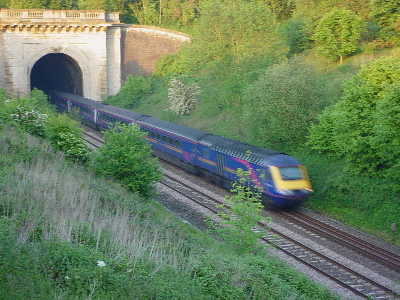 Box Tunnel is about 10 kms from our hotel and training centre - Well House Manor, in Melksham. Business and leisure guests welcome all year.